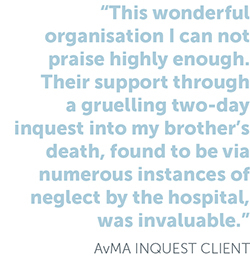 Our work with people affected by avoidable harm in healthcare can change lives. And there is no other charity in the UK doing the work we do. But we receive no government funding and the support, advice and relief we offer is only possible due to the wonderful generosity of our supporters. So can you help us to carry on our vital work? 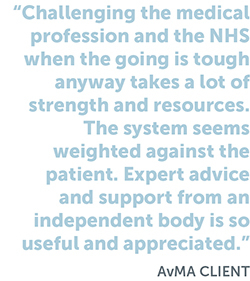 By signing up to be a Friend of AvMA and making a regular donation you will belong to a growing movement for change, helping us to give vital support to injured patients and to be a powerful voice for patients, patient safety and justice. Benefits of membership include our free newsletter, invitations to special events and the chance to share your thoughts on our work and policy issues. Most of all, you will have the satisfaction of supporting our vital work and being part of our movement. It’s simple: just fill in the donation form below.